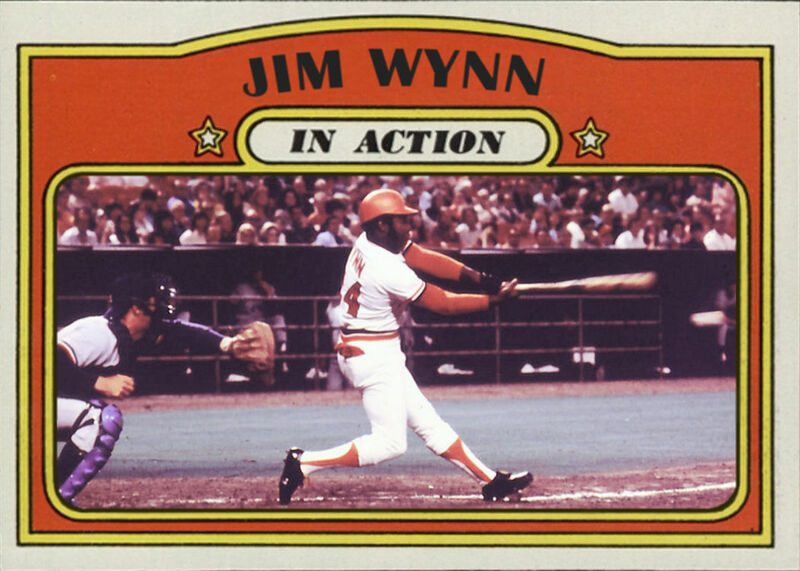 The "Toy Cannon" has been a fan favorite on many teams, but Jim Wynn's MLB career began in Houston, first with the Colt .45s then the Astrros. 1972 was somewhat a comeback year for the Cannon. His production in 1971 was off while he was recovering an off-season surgery. He and his wife were arguing when Wynn pulled an unloaded shotgun. His wife grabbed a steak knife and stabbed him in the abdomen. No charges were filed as Wynn admitted that it was his own fault. As a result his batting average dropped from .282 in 1970 to just above the Mendoza line in 1971. By 1972 his numbers were back to where they belonged. He hit .273 with 24 homers and 90 RBIs. 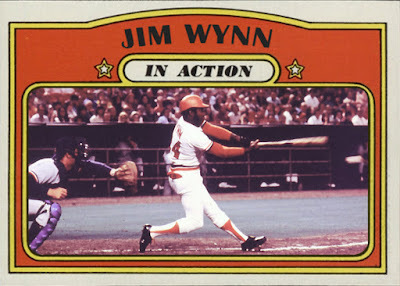 In 1973 under new manager, Leo Durocher, Wynn was moved from #3 in the order to leadoff to take advantage of his speed. Predictably, his batting average and RBI's dropped significantly. But the numbers you'd expect to go up by such a change - walks, runs scored and stolen bases - dropped also. After the season he was traded to Los Angeles where he staged yet another comeback. But that is a story for another day. J.R. Richard is another tragic story of what might have been. He was the first round draft pick of the Astros in 1969. But it wasn't until 1975 that he broke through. Although he was wild, leading the league in both walks and wild pitches, he managed a 12-10 record and 176 strikeouts. The following year he would win 20 games, lower his ERA to 275 and strikeout 214. He won 18 games in each of the next three seasons, leading the league in strikeouts in 1978 and 1979. Ha had the lowest ERA in 1979. With the addition of Nolan Ryan in 1980 the future never looked brighter. On July 30, 1980 James Rodney Richard had a stroke during warm-ups before a game in Philadelphia. Less than 2 weeks after his first All Star game, Richard's career was over. He played minor league ball for the Astros in 1982 and '83 but he was clearly not the same pitcher. He was ultimately released by the Astros just before the 1984 season. This 1973 Topps card is a missing link in Richard's collection. After sharing a "Rookie Stars" card with Bill Greif and Ray Busse in 1972, his next Topps card would be in 1974. 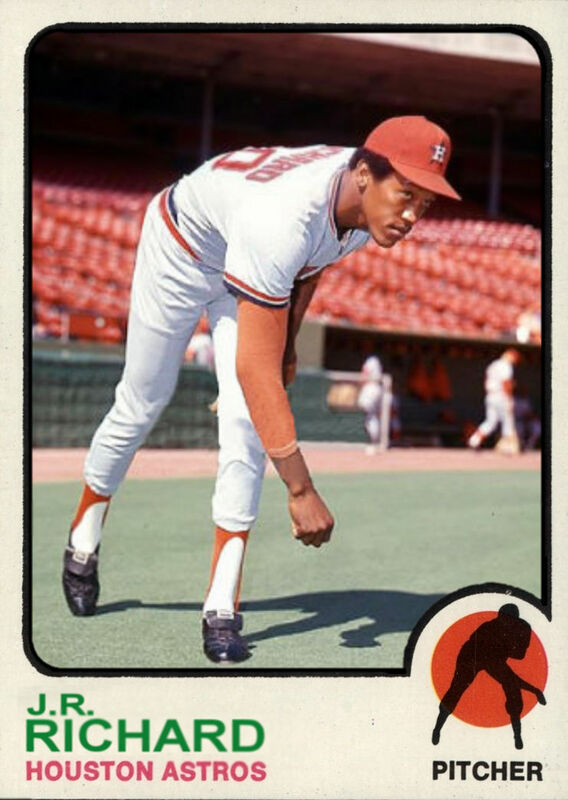 Not that I can blame Topps, J.R. spent most of 1972 pitching for the Oklahoma City 89ers.